CV Graphics and Printing plastic letters offer the greatest variety of dimensional plastic letters available today–from traditional to ornamental and script. CV Graphics high standards will mean you get the highest quality letters, with the fastest delivery, at the lowest possible price, all with a Lifetime Guarantee. CV Graphics manufacturers 3 different lines of plastic letters. Available in over 30 standard colors and virtually any style under the sun. Your search for your plastic letters is about to come to an end. Metal Letters are as timeless as our need to communicate with words in creating signs. At CV Graphics, each metal letter is manufactured one-by-one in aluminum, bronze, brass, copper or steel using up to twenty distinct manufacturing steps. Yet prices remain competitive because of our tailored production processes and seasoned professionals. Our numerous metal finishes give you the choice of dazzling shine, brilliant color, or natural and antiquated metal. 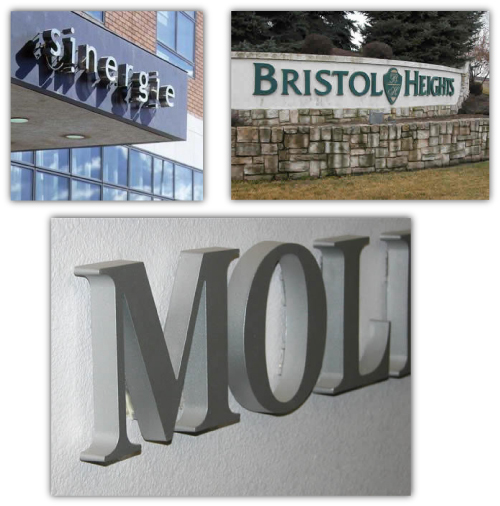 Combine these finishes with an extensive selection of letter styles to design signs that reflect your individual image. Located in San Diego, California, provides San Diego Printing Services, including: Conventions, Trade Shows and other local Cities / Counties: Alpine, Bonita, Borrego Springs, Cardiff by the Sea, Carlsbad, Chula Vista, Coronado, Del Mar, El Cajon, Encinitas, Escondido, La Jolla , La Mesa , Las Vegas, Mission Beach, New York, Oceanside, Ocean Beach, Orange County, Pacific Beach, Poway, Rancho Bernardo, Ramona, Rancho Santa Fe, San Marcos, San Diego, Santee, Solana Beach, Temecula (Riverside County), San Clemente, Valley Center, Vista. Services include: Graphic Design, digital printing and offset printing, web design, logo design, marketing, book and booklet printing, business card printing, brochure printing, catalog printing, envelope printing, flyer printing, postcard printing, promotional product printing, sign printing, sticker printing, Full Color Canvas Prints, T-shirts, direct to garment printing, full color photo t-shirt, Banners, Signs and much more.